politicalbetting.com » Blog Archive » Is now the time to bet against Obama? « Is the 50p tax the next Coalition battleground? Is now the time to bet against Obama? Should he really be such a tight odds-on favourite? One statistic about US politics that has been bandied about quite a lot recently is that no US president since Franklin Roosevelt has been re-elected with the unemployment rate above 7.2%. The figure for this month is 9.2%. It will take some turnaround for the rate to get back down by November next year, particularly in light of the sluggish growth figures released there this week. As they say in the adverts, past performance is no guarantee of future outcomes – but itâ€™s often not a bad guide. That being the case, should Obama really be the 4/6 shot he is on Betfair, never mind 4/7 with Ladbrokes which is itself the best odds with a bookie? Obama won an astonishing number of votes in 2008: nearly eight million more than any other candidate in history. Even so, it was not the landslide some in the media would have the world believe. John McCain – by no means the strongest of Republican candidates – himself polled the third-highest ever number of votes, and Obama won fewer Electoral College votes than Clinton, Bush snr or Reagan did in any of their victories. The economy is a particular vulnerability with the Hope/Change message that Obama ran on last time. Having raised expectations, hope is in short supply, change has not necessarily been for the better. He has been reduced quite rapidly to Just Another Politician. That may change once back on the campaign trail – he still gives a good speech – but he can never again be the fresh face of the future. Perhaps fortunately for him, the election is not (just) a referendum on his first term but a choice between him and his Republican opponent. That field already looks quite thin. Palin looks unlikely to run with Bachmann making strong inroads into Tea Party territory but neither is really a credible candidate. Huntsman and Pawlentyâ€™s campaigns have been at best tepid and show no sign of catching the public imagination. That only really leaves Mitt Romney and Texas Governor Rick Perry – though the latter has yet to formally declare. At the time of writing, Perry was best-priced with Ladbrokes at 7/1 (which unusually is longer than Betfair even before commission), while Romney could be backed at 11/2 with both bet365 and Victor Chandler and was slightly longer on Betfair. All these seem good value given the lack of strong contenders in the primaries and the far less clement conditions Obama faces this time around. An alternative strategy would be to lay against Obama, whose price will surely drift at some point. Both Republicans have their weaknesses as potential candidates but then so does Obama. Of more immediate concern are the Debt Ceiling negotiations. These are complex, multilateral and could have any number of outcomes. One pertinent fact however is that Obama is involved in them while both GOP frontrunners are Washington outsiders. That makes the political cost of failure much more personal to him, even before any economic effects of a shutdown and/or credit downgrade are felt. Likewise, any cuts into his healthcare programme reduces the record of delivery heâ€™ll have to stand on. 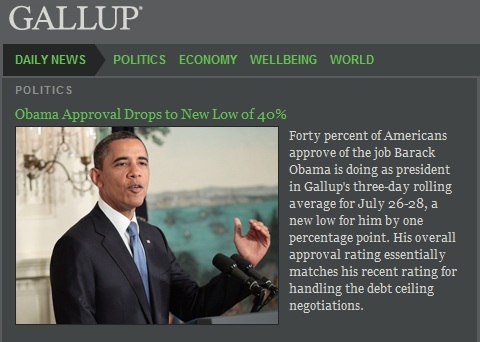 Obamaâ€™s approval ratings hit a new low of 40% this week including just 34% among independents. The figure may have been adversely affected by the debt ceiling games. Even so, heâ€™s been below 50% for most of the last year, something which doesnâ€™t tally with re-election odds of 4/6 or shorter unless thereâ€™s good reason to expect him to turn it around. Itâ€™s easy enough to create scenarios as to how he might do that but the reality is that the hard stats are at best mixed. The race feels much more of a toss-up at the moment with Obama no shorter than evens and probably marginally odds-against.